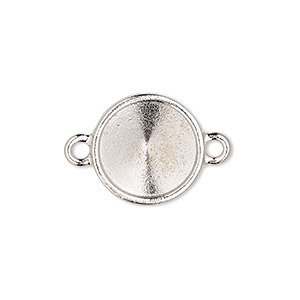 Link, Almost Instant Jewelry® and TierraCast®, rhodium-plated pewter (tin-based alloy), 21mm round with 18mm rivoli setting. Sold individually. 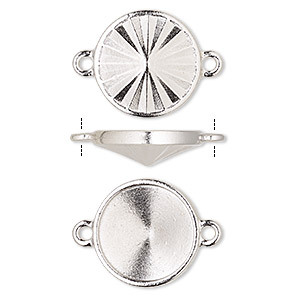 Custom set Swarovski® crystal rivolis into rhodium-plated pewter (tin-based alloy) link settings with decorative backs. The pointed back surface of the rivoli fits perfectly into the chaton-style component. Use your favorite adhesive for a secure fit. Designed to fit 18mm Swarovski® crystal rivolis (1122). All original designs, copyrighted by TierraCast®. 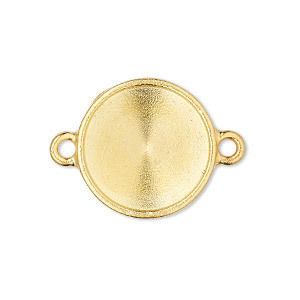 Link, Almost Instant Jewelry® and TierraCast®, gold-plated pewter (tin-based alloy), 21mm round with 18mm rivoli setting. Sold individually. 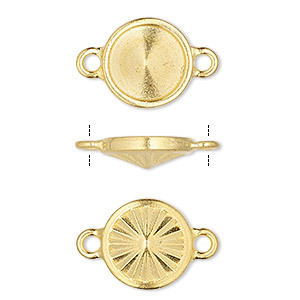 Link, Almost Instant Jewelry® and TierraCast®, gold-plated pewter (tin-based alloy), 14mm round with SS47 rivoli setting. Sold individually.